Hey, sweetie. Remember when I wondered out loud if I should be watching “Person of Interest” because of the shippy nature of the Root and Shaw relationship? And you were all, yes, dummy. Yes. Well, while on vacation back home I happened to sit down with my mother (who, as previously mentioned, loooooves the show) and finally watched an episode. Boy, did the show show me. So now, obviously, I am hooked. Quick recap, in an episode meant to illuminate The Machine’s seemingly infinite, nano-second decision-making process we are taken through a series of simulations as the team – particularly the persons of gay lady interest in the form of Amy Acker’s Root and Sarah Shahi’s Shaw – try to save the world (well, stock market) and themselves in a nearly impossible situation. Watching the episode unfold was fascinating for a number of reasons. First, it confirmed what careful (and gay) viewers have been seeing for a while now. The attraction between hacker Root and sociopath Shaw has been obvious to many, but possibly not overt to all. But, holy crap, did they out it forever last week. At first I thought it was just a little playful acknowledgement of this ship. But then, BOOM, it went full canon. Have no doubt, people, The Machine ships it. That, my friends, is a stand up, slow clap, hats off moment of a show taking subtext into maintext. Granted, I’m none to happy about the possibly dead thing. But, also, I have much hope that she isn’t actually dead. (p.s. Sarah Shahi’s pregnancy – with twins – facilitated this storyline in the first place.) And if she isn’t dead, that means at some point the show will have to come to terms with the BIG LESBIAN FEELINGS it unleashed on these characters. Also, how wonderful is it to see Fred and Carmen together? So wonderful. Admit it, they’re good together. Of course, on the flip side, if she is dead, ugh – really? Another dead queer female character? Don’t even get me started. So let’s just trust The Machine knows what’s good for it and we shall see Shaw again someday. I don’t know. I really don’t know. But damn this show sure has my interest now. And I, like The Machine, will be watching. Pregnancy with twins is a legit reason to potentially off a character, regardless of sexuality...so if we didn't have so many stupid reasons for killing off the lesbian, this wouldn't feel a tad like "just another dead lesbian to further the plot." That said, it's an awesome show and I'm thinking if it lasts for another few seasons (you know how fickle networks can be), we'll see Shaw again! I don't know how they can make Shah un-dead. She was bleeding out, there was a bang suggesting a final head shot, and all the members of the machine's crew were accounted for. No one left to save her, except the german shepherd. Really bummed. I loved the confident, slightly crazy nature of her character. Anon above has clearly never seen a sci fi show or even apparently watched the rest of POI? Kara was "dead" too. Dead to the tune of being blown up by a missile from a jet. Aaaaand guess what. No body shot? No death. That's one of the first rules of genre TV. Its frustrating that Shaw as a queer lady is potentially dead, but Shahi has said the writers were willing to try and write her pregnancy into the show and ultimately she was the one to say that wasn't true to the character. I have very little doubt we will see Shaw show up (probably late in season 5) in a very important way. I hope you watch the entire series to get an idea of what to expect with POI. This is not a relationship show where they will be going out on dates or show any physicality. The kiss in the last episode was more than we ever expected. I hope if you continue to cover POI you judge what they do with Shoot based on what this show is rather than comparing it to what other shows do. I wonder if dorothy even watches the show of if she just watched this episode or youtube clips, it's obvious she knows nothing about the show. The final bang was the door closing. Also Amy Acker. That is all. and then out come the anons! telling us 'you just don't get it' or 'this one was legit bc of the real life pregnancy' which really isn't the point. the writers still have choices and killing Shaw off for really reals is NOT a good choice. ok. so stop trying to control the conversation. This is a great little recap, and I appreciate the perspective considering how annoyingly clogged up the boards have been with anti-lesbian sentiment. It's called adding context to a discussion. Calm down. I'm also adding context. And I'm questioning your right (and others) to present as experts when you're really just trolling gatekeepers. After last night's episode, it's pretty clear that Shah is alive somewhere. Have those twins and get back to the show, girl, it's not nearly as much fun without you! I heard this was the end of the series which means nothing will happen is that true? "Also, how wonderful is it to see Fred and Carmen together? So wonderful. Admit it, they’re good together." My heart skipped a couple of beats when I read that. Carmen would definitely give her life to save Fred.
" 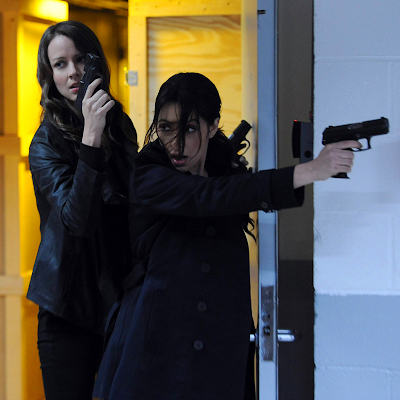 the writers still have choices and killing Shaw off for really reals is NOT a good choice." 1. No body, not dead. One of the cardinal rules of TV. 2. Did you even bother to watch the last episode including the preview? Because if you did you'll know that the possibility of Shaw being alive is very real. That being said, either way there's no way Sarah Shahi can stay in the show because you know TWINS. The exec producers repeatedly have said that they would really like to have Sarah to come back, should she ever get a chance. But at this point it's all up in air. I was legitimately heartbroken when I thought at the end of the ep that she was dead. However now that I know that she is having babies, it makes sense. I'm glad they had the kiss, just wish we could have seen both their faces during it but Amy Ackers beautiful hair got in the way. I'm gonna go with my hope that Sameen isn't dead. Maybe her buddy that let her go last time was there and that last shot was him killing the blonde agent? That would be SWEET. I understand that Sameen is a socio path but she does have some feelings which are shown by how much she loved the dog.. Most socio paths would be more interested in dissecting a dog then loving it..
Like that one little girl said on the episode its like her feelings are turned town really low. She has them she just doesn't know how to access them most of the time. I really hope my OTP gets together eventually. That would be nice. Plus it would be interesting to see how their dynamic change after 4x11. lol who would have thought an iron to the face, a bullet to the shoulder, a few tasers to the neck and etc would have amounted to a passionate kiss and a 'my life for hers' situation.